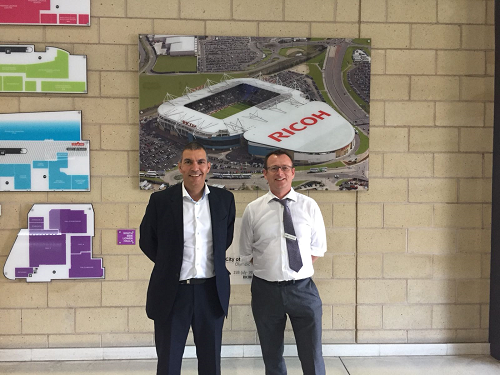 Worcestershire based Independent Connections Provider, Rock Power Connections, have conducted an internal training day for Commercial Estate Agents, Fisher German at Coventry’s Ricoh Arena. Taking place on Wednesday 4th July 2018, Rock Power Connection’s Commercial Director, Kev Sankar, delivered an informative and engaging presentation on upgrading and installing new power supplies to commercial property, whilst introducing the firm’s complimentary sister services – Rock Surveying and Rock Clean Energy. Fisher German provide specialist asset and property management consultancy throughout the UK. Covering a broad property spectrum and having infrastructure and utilities embedded within the core services they offer; the training session gave around 200 members of the Fisher German team an ideal opportunity to brush up their knowledge. Within the presentation, Kev covered a range of topics, including a brief overview of Rock Power and the basic knowledge of electrical connections, analysis of transmission and distribution network alongside the competition in the connections market. Delegates were also introduced to the importance of Utility Surveying for mapping recorded and unknown services – delivered through Rock Surveying – together with the benefits of battery storage for back-up energy supply, as provided by Rock Clean Energy. Since inception in 2013, the firm has established an excellent reputation in working with commercial estate agents, understanding the complexities that surround implementing and upgrading power supplies within a vast range of commercial buildings. For more information, please visit www.rockpowerconnections.co.uk.